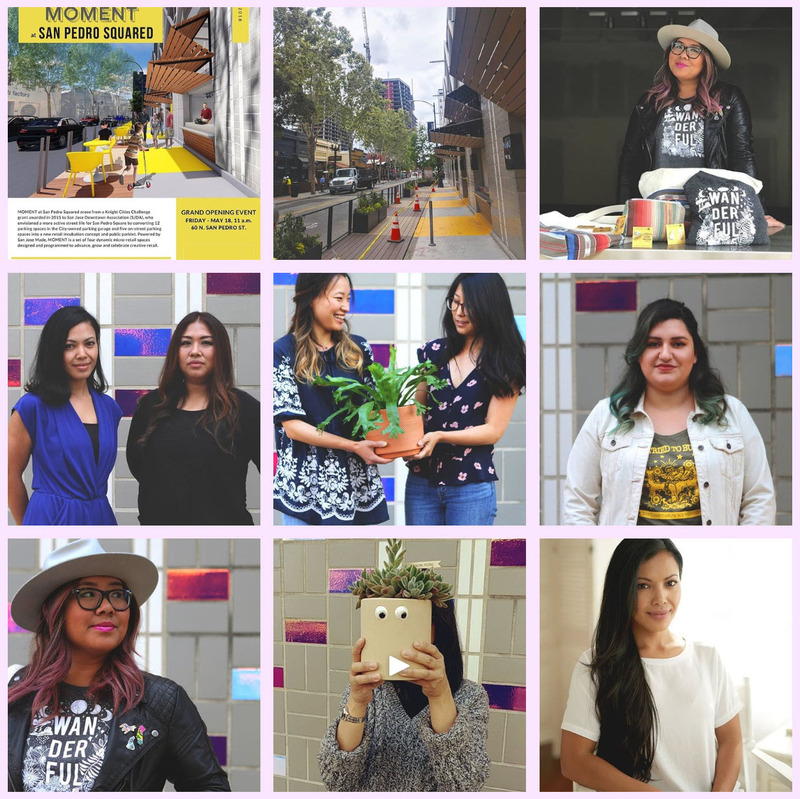 The San Jose Blog: MOMENT at San Pedro Squared opens today! MOMENT at San Pedro Squared opens today! One of the most exciting retail improvements to Downtown San Jose in years is launching today. San Pedro Squared is a Knight Foundation-funded project that adds four micro-retail spaces on the ground floor of the San Pedro Square garage. San Pedro is arguably the most lively street Downtown right now, but has always been held back by only having restaurants, bars, and the occasional shop on one side of the street due to the massive parking structure. 12 parking spaces have been converted into four 400 SQFT businesses for local entrepreneurs. It gets better. The four businesses are all women-owned ventures with strong ties to San Jose offering unique and innovative products. You can see the descriptions of each below along with links to their websites. San Pedro Squared is having their grand opening today at 11am. Please patronize our new local businesses--this is the type of grassroots project that adds character to Downtown! SAN JOSE (April 30, 2018) – With the conversion of parking into micro-retail shops at the Market-San Pedro Garage completed, four locally owned retailers will be part of the new destination’s grand opening May 18. The shops collectively will be known as MOMENT at San Pedro Squared. MOMENT exercises a new approach to retail that allows temporary shops to coalesce with traditional brick-and-mortar experiences. “We want MOMENT to serve as a platform for small businesses to make the leap from part-time to full-time,” said Kevin Biggers, chief strategist for San Jose Made, which is curating the vendors and managing the spaces for San Jose Downtown Association. The conversion of parking spaces into retail shops was called San Pedro Squared because it adds activation and street life to the garage side of San Pedro Street on one of downtown’s most popular blocks. The SJDA proposal to turn 12 parking spots on the San Pedro Square side of the garage into four 400-square-foot business spaces was a winner of the 2015 Knight Cities Challenge, an initiative of the John S. and James L. Knight Foundation that seeks to make the cities where Knight invests more vibrant places to live and work. 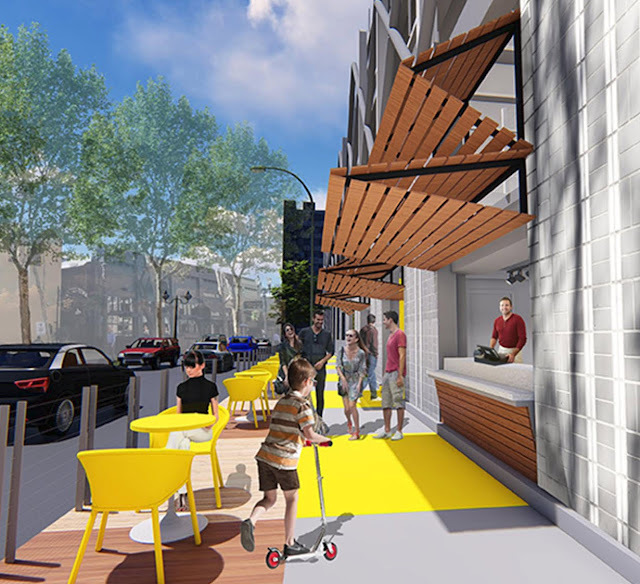 The Knight Foundation, along with the Downtown San Jose Property-Based Improvement District (PBID) and City of San Jose – owners of the garage – funded the project, including a new parklet that extends along the sidewalk into a seating and social area in front of the shops. The parklet replaced five street parking spaces. “With MOMENT, the entire block of San Pedro between St. John and Santa Clara streets becomes more active at the perfect time when new residential developments around the square near completion,” said Chuck Hammers, PBID president. “For small business owners like myself, MOMENT provides an opportunity for us to get back into our community, engage with our customers and build a presence that is increasingly more difficult to do online,” said Angie Chua of Bobo Design Studio, a San Jose native who quit her job in a tech-based startup to pursue her dreams as a creative business owner. San Pedro Squared was designed by Gensler and Eaton Hall Architecture, and built by TICO Construction. The project’s evolution has been documented atsanpedrosquaredsj.com. The San José Department of Transportation (DOT) plans, develops, operates, and maintains transportation facilities, services, and related systems that contribute to the livability and economic health of the city. Our goal is to provide a transportation system that is safe, efficient, and convenient for all modes of transportation, and which supports San José’s livability and economic vitality.